HP C6578AN (No. 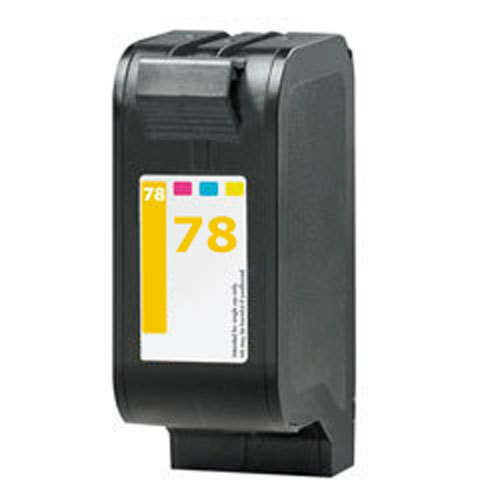 78) Remanufactured Tri-Color Inkjet Cartridge at unbelievable price saves you money without sacrificing quality. The compatible inkjet cartridge (also known as generic) are specially engineered to meet the highest standards of quality, reliability and exceptional yields that meet to exceed OEM (Original Equipment Manufacturer) standards and offer high-quality results. If you're looking for maximum performance, reliability and dramatic savings, this inkjet cartridge is the choice for you. 100% satisfaction guaranteed. Avg Yield: 970 pages at 5% coverage. I was a little worried after reading reviews but so far the color cartridge has worked great for me! It arrived much faster than I thought and it saved me a lot of money. I also bought a black cartridge and no complaints with that! SUPER REPLACEMENT CART. VERY PLEASED. 10-30-2005; first color cartridge i got printed only blue. sent back and replacement is as good as orginal. time delay in getting replacement and cost of return postage is only problem. will deffinately order again. The first one I bought worked well. The second came out of the box printing no yellow. 1 RMA and three weeks later, my third one is working well so far. Time delays on an RMA might make this inappropriate in a business environment! I bought 3 pack for my 940C. 1st work... amazing it works and now have 6 months needed to replace. 2nd & 3rd ones.... ummm no RED... everthing has a BLUE tint. Now does anyone read this and cares to fix my problem ? Who do I report problems to? Had a problem with the red ink right out of the box also. Replaced with no problem. We'll see if the replacement works. I wonder if there are issues with the manufacturing?!? I recieved my ink cartridge pretty fast 3-4 business days. Somehow I got the C6578D instead, but luckily it seemed to be fully compatible with my PSC 950. The first cartridge performed perfectly, as good as any original HP cartridge I've used. Purchased a second cartridge and after using 10 % of the cartridge, a problem developed with one of the colors...almost no red is being dispensed. Great. Just as good as OEM.